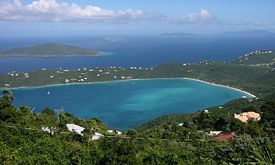 The U.S. Virgin Islands consist of the main islands of Saint Croix, Saint John, and Saint Thomas, along with the much smaller but historically distinct Water Island, and many other surrounding minor islands. The total land area of the territory is 133.73 square miles (346.36 km²). During the seventeenth century, the archipelago was divided into two territorial units, one English and the other Danish. Sugarcane, produced by slave labor, drove the islands' economy during the eighteenth and early nineteenth centuries. In 1917, the United States purchased the Danish portion, which had been in economic decline since the abolition of slavery in 1848. The islands' crystal clear waters, white-sand beaches and beautiful coral reefs draw over 2.5 million visitors annually. Tourism income is a mainstay of the economy. The U.S. Virgin Islands are located in the Caribbean Sea and the Atlantic Ocean, about 50 miles east of Puerto Rico and eleven hundred miles southeast of Miami, Florida. 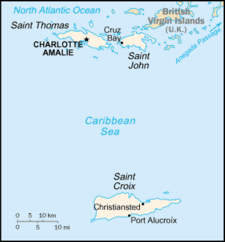 The territory consists of four main islands: Saint Thomas, Saint John, Saint Croix, and Water Island, as well as several dozen smaller islands. The combined land area of the islands is roughly twice the size of Washington, D.C. The islands were formed almost 100 million years ago, when volcanic eruptions forced the undersea crust above the ocean's surface. 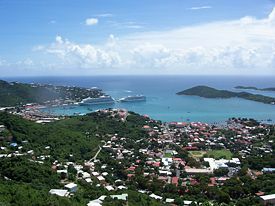 The U.S. Virgin Islands are known for their white sand beaches, including Magens Bay and Trunk Bay, and strategic harbors, including Charlotte Amalie and Christiansted. The terrain is mostly hilly to rugged and mountainous with little level land. The highest point is Crown Mountain on Saint Thomas at 1,556 feet (474 m). Saint Croix, the largest of the U.S. Virgin Islands, lies to the south and has a flatter terrain. 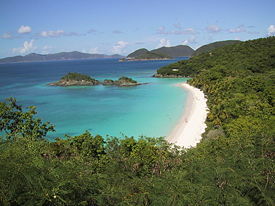 The National Park Service owns more than half of Saint John, nearly all of Hassel Island, and many acres of coral reef. Whales breed off of the north end of Saint Thomas from January through April. The Virgin Islands lie on the boundary of the North American plate and the Caribbean Plate. Natural hazards include earthquakes, hurricanes, and tsunamis. In recent history, substantial damage was caused by Hurricane Hugo in 1989 and Hurricane Marilyn in 1995. The islands were also struck by Hurricane Bertha in 1996, Hurricane Georges in 1998 and Hurricane Lenny in 1999, but damage was not as severe in those hurricanes. The climate is subtropical, tempered by easterly trade winds, with relatively low humidity, little seasonal temperature variation; the rainy season is September to November. Although not much is known about the Ciboney people who first inhabited the islands during the Stone Age, they were hunter-gatherers. They made tools of stone and flint but left no other artifacts behind. Experts at canoe building and seamanship, the Arawaks (Taino) are generally believed to have migrated from the Amazon River Valley and Orinoco regions of Venezuela and Brazil, settling on the islands near coasts and rivers. These peaceful people excelled at fishing and farming. Their main crops were cotton, tobacco, maize, yucca, and guava; they grew a variety of other fruits and vegetables as well. The Arawaks developed rich social and cultural lives. For recreation, they held organized sporting events. They also valued artistic endeavors, such as cave paintings and rock carvings, some of which have survived to the present day. Religion played a large role in their daily lives, and through ceremonial rituals they asked their gods for advice to help them through troubled times. Their civilization flourished for several hundred years, until the Caribs invaded. While the Caribs came from the same area as the Arawaks and may have been distantly related, they did not share the Arawaks' friendly nature. Not only were they fierce warriors, they supposedly feasted on their adversaries. Their bloodthirsty reputation spawned the English word "cannibal," derived from the name the Spanish gave them, Caribal. Whether or not they actually ate their victims, the Caribs did destroy numerous Arawak villages, murdering as many as they could. By the mid-fifteenth century, the Caribs had slashed the Arawak population from several million to a few thousand. Blown off course during his 1493-1496 voyage, Christopher Columbus landed on Saint Croix, then continued his explorations on Saint Thomas and Saint John. He gave the islands their original Spanish names (Santa Cruz, San Tomas, and San Juan), focusing on religious themes. The collection of tiny islets, cays, and rocks dotting the sea around them reminded Columbus of Saint Ursula and her 11,000 virgin martyrs, inspiring the name Las Once Mil Virgenes. The first encounter Columbus had with the Caribs quickly erupted into a battle. When Columbus and his crew decided to move on to other islands, they kidnapped six Arawaks to guide them. Although Columbus left without founding a colony, many more battles between the Spanish and Caribs followed over the next century. Other European explorers tried to convert the Caribs and Arawaks to Catholicism, which largely failed. They also enslaved the native populations to work on plantations. With tobacco already cultivated on the islands, it made a good cash crop. Later, coffee, sugar, and cotton also were grown. Slavery, coupled with murder and disease, took a large toll on both the Arawaks and the Caribs. Several groups of Arawaks committed mass suicide rather than submit to foreign rule. By the late seventeenth century, the Arawaks had been completely exterminated and few Caribs remained. With no native slaves left, the African slave trade began in 1673. The difficult conditions and inhumane treatment slaves were subjected to bred discontent. In 1733, a long drought followed by a devastating hurricane pushed slaves in Saint John to the breaking point. They staged a massive rebellion, seizing control of the island for six months. The Danish, who controlled the island at that point, enlisted the help of the French to regain control. The Danish West India Company had settled on Saint Thomas in 1672, on Saint John in 1694, and purchased Saint Croix from France in 1733. The islands became royal Danish colonies in 1754, their name translating to Jomfruøerne in Danish. Sugarcane, produced by slave labor, drove the islands' economy during the eighteenth and early nineteenth centuries, until the price of sugar on the world market dropped when beet sugar was introduced commercially. In 1833 Great Britain emancipated all slaves on British-held plantations in the Americas, including all those on neighboring Caribbean islands, causing great concern for the remaining slave-based plantations. Another slave revolt in 1848 was more successful. The governor at the time, Peter von Scholten, felt enough sympathy for the slaves to grant them emancipation, even though it was against the wishes of Danish rule, on July 3, 1848. The onset of World War I brought reforms to a close and again left the islands isolated and exposed. The United States, fearing that the islands might be seized by Germany as a submarine base, again approached Denmark about buying them. After a few months of negotiations, a selling price of $25 million was agreed on. The Danish Crown may have felt some pressure to accept the sale, thinking that the United States would seize the islands if Denmark were invaded by Germany. At the same time, the economics of continued possession weighed heavily on the minds of Danish decision makers, and a bipartisan consensus in favor of selling emerged in the Danish parliament. A subsequent referendum, held in late 1916, confirmed the decision to sell by a wide margin. The deal was thus finalized on January 17, 1917, when the United States and Denmark exchanged their respective treaty ratifications. The United States took possession of the islands on March 31, 1917, and the territory was renamed the Virgin Islands of the United States. U.S. citizenship was granted to the inhabitants of the islands in 1927. Water Island, a small island just to the south of Saint Thomas, was not included in the original sale. It remained in the possession of the Danish East Asiatic Company until 1944, when it too was bought by the United States for $10,000. It was initially administered by the U.S. government and did not become part of the U.S. Virgin Islands territory until 1996. The U.S. Virgin Islands are an organized, unincorporated territory of the United States. Even though they are U.S. citizens, Virgin Islanders cannot vote in U.S. presidential elections. The main political parties in the U.S. Virgin Islands are the Democratic Party of the Virgin Islands, the Independent Citizens Movement (ICM), and the Republican Party of the Virgin Islands. Additional candidates run as independents. At the national level, the U.S. Virgin Islands elects a delegate to Congress from its at large congressional district. However, the elected delegate, while able to vote in committee, cannot participate in floor votes. The current House of Representatives delegate is Donna Christensen (D). At the territorial level, fifteen senators—seven from the district of Saint Croix, seven from the district of Saint Thomas and Saint John, and one senator at-large who must be a resident of Saint John—are elected for two-year terms to the unicameral Virgin Islands legislature. The U.S. Virgin Islands has a District Court, Supreme Court, and Superior Court. The District Court is responsible for federal law, while the Superior Court is responsible for Virgin Islands law at the trial level and the Supreme Court is responsible for appeals from the Superior Court for all appeals filed on or after January 29, 2007. Appeals filed prior to that date are heard by the Appellate Division of the District Court. Judges are appointed by the president and the governor, respectively. The United States Congress has organized several local referendums to aid in self-determination. As with Puerto Rico, the residents have been given the choice of independence, status quo, or statehood; however, these measures have failed to attract sufficient civic interest or voter turnout to produce even a noteworthy plurality, much less a majority, and thus the islands will retain their current territorial status for the foreseeable future. With much controversy, these efforts by the federal government to normalize the unincorporated territory's status are completely discounted by the United Nations Committee on Decolonization, and the U.S. Virgin Islands are currently in the United Nations list of Non-Self-Governing Territories. The U.S. Virgin Islands are divided into two districts and subdivided into twenty sub-districts. The manufacturing sector consists of petroleum refining, textiles, electronics, rum distilling, pharmaceuticals, and watch assembly plants. The agricultural sector is small, with most food being imported. International business and financial services are a small but growing component of the economy. Hovensa, one of the world's largest petroleum refineries, is located on Saint Croix. The government is working to improve fiscal discipline, to support construction projects in the private sector, to expand tourist facilities, to reduce crime, and to protect the environment. GDP per capita is $14,500 (2004 estimate). As of the census of 2010, the population of the U.S. Virgin Islands was 106,405, a decrease of 2.0 percent from the 2000 Census population of 108,612. Most U.S. Virgin Islanders are descended from Africans, who were enslaved and brought to the Caribbean by Europeans to labor on sugar plantations. Most of the residents were born in the islands, although many migrated to the U.S. Virgin Islands from other islands in the West Indies, the United States, and other countries. The official language is English, although Virgin Islands Creole, an English-based dialect, is spoken in informal situations. The Virgin Islands Creole spoken on St. Croix, known as Crucian, is slightly different from that spoken on St. Thomas and St. John. Because the U.S. Virgin Islands are home to thousands of immigrants from across the Caribbean, Spanish and various French creole languages are also widely spoken. As in most Caribbean countries, Christianity is the dominant religion. In a reflection of the territory's Danish colonial heritage, Protestantism is most prevalent although there is also a strong Roman Catholic presence. Historically, the society was divided along caste and color lines. Even after emancipation in 1848, ex-slaves' participation in the political process was restricted and their freedom of movement and emigration were limited by legislation. A result of Danish determination to maintain the status quo was the Fireburn of 1878, a labor revolt on Saint Croix that destroyed many plantations. Several cultures have influenced local architecture. Wattle and daub construction, the use of cisterns to collect water, the "Big Yard" or common area, and verandas and porches can be traced to Africa. Danish culture is reflected in the design of towns, especially the "step streets"; street names; ovens and cookhouses; and red roofs. Yellow ballast brick, carried in ships from Europe, was used in construction along with locally quarried stone and coral. Open market areas, formerly the sites of slave markets, are found in the main towns. Many urban buildings date back to the colonial period. Cassava, pumpkins, and sweet potatoes are native to the islands, and a variety of seafood is found in the surrounding waters. Many recipes are based on African sources. Okra is an ingredient in killaloo, a stew with local greens and fish, and in fungi, a cornmeal-based side dish; conch appears in fritters, chowders, and mixed with rice. Guava, soursop, and mango are eaten, along with mamey and mesple. Sugar cakes made with coconut and boiled sugar are a traditional mid-afternoon snack. Maubi, a local drink, is made from the bark of a tree, herbs, and yeast. Souse is a stew of pig's head, tail, and feet, flavored with lime juice that is served on festive occasions. ↑ 1.0 1.1 Central Intelligence Agency, Virgin Islands The World Factbook. Retrieved January 17, 2012. ↑ 2.0 2.1 Danish National Archives. A Brief History of the Danish West Indies, 1666-1917 Retrieved December 15, 2007. ↑ U.S. Census Bureau, U.S. Census Bureau Releases 2010 Census Population Counts for the U.S. Virgin Islands August 24, 2011. Retrieved January 31, 2012. Countries and their Cultures. Culture of United States Virgin Islands Retrieved December 15, 2007. United States Census Bureau. Virgin Islands of the United States Retrieved December 15, 2007. History of "U.S. Virgin Islands"
This page was last modified on 5 January 2016, at 16:55.